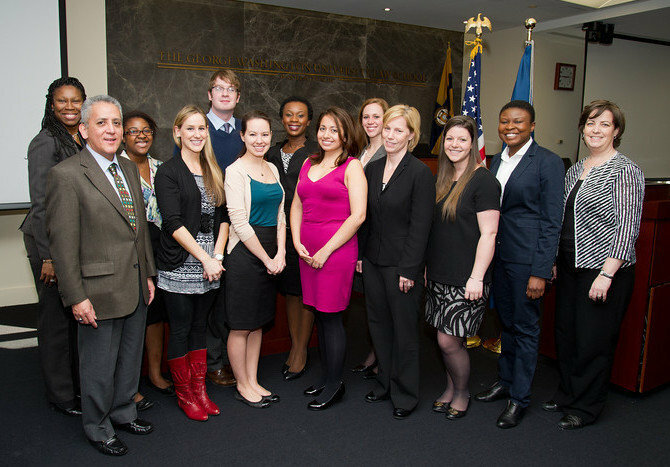 This article was prepared by the George Washington Law School Immigration Clinic and was written by GW Law Professor Alberto Benitez (second from left) and Immigration Clinic Alumni Cleveland Fairchild (fifth from left), Binta Mamadou (seventh from left), and Rebekah Niblock (fourth from left). One of the most common sound bites to emerge from the ongoing immigration debate is that the immigration system is somehow “broken.” I have directed the George Washington Law School Immigration Clinic since 1996, and I do not share this view. The reality is that most critics have never set foot in an immigration court or a detention center. The immigration system is not broken. The system has flaws and there is room for improvement, but it works well for most people in most cases. The student-attorneys who I supervise are all in their third year of law school and come from different walks of life. Despite their differences, the students share a common objective of wanting to help people and be a part of an immigration system that saves lives and reunites families. A great big hug exchanged between a student-attorney and her client’s two children exemplifies the immigration system working as it should. Earlier in the day, the student-attorney accompanied her client to the Immigration and Customs Enforcement (ICE) Field Office to figure out what was going on with the client’s case. The client had recently come to the United States with her two children to flee gang-related violence. The client found herself in a new country with a different language and swept into an immigration system that she did not understand. As the student-attorney stood in line waiting to speak to an ICE official, the client stood trembling with her two children at her side. The client began to pray and perform the holy trinity in Spanish. After waiting for some time, the student-attorney asked to speak directly with the ICE officer managing the client’s case. The ICE official agreed to meet with the student-attorney and informed her that the client was in removal proceedings and would be receiving a court date shortly. The client was utterly confused and she did not understand the conversation until the student-attorney translated the information into Spanish. Even though the client learned that she was in removal proceedings, she felt a sense of relief because she now had answers and knew exactly what was going on in her case. When the student-attorney and the client parted, the client’s children reached up and gave the student-attorney a great big hug. While trips to the ICE Field Office are understandably terrifying for immigrants, news to the clients that they will have their day in court is proof that the system works. As the woman fell to her knees outside the courtroom following her hearing, I could tell that the student-attorney was caught off-guard. The woman was in tears, but these were tears of joy. After more than two years of uncertainties, countless meetings, and medical and psychological evaluations, she could now sigh in relief. At that point, she knew that she would never have to return to the country responsible for the disappearances and deaths of several family members and where she had suffered for expressing unpopular political views. I observed the student-attorney’s reaction. I could tell that she maintained her composure because lawyers are taught to be stoic, particularly in front of their clients. In those few minutes, I recalled the student once telling me that she had dreamed about the ICE attorney who she had to face during the trial. I remembered how hard the student-attorney worked on behalf of the client and the emotional roller coaster that she endured. Her personal commitment to the case was extraordinary-she even gave the client a suit to wear to court! Naturally, she questioned the strength of the case and whether the client would be granted asylum even though the client’s claim was compelling. On the day of the trial, the student-attorney went to court prepared to advocate for her client. After both sides made their arguments, there was a long period of silence while the immigration judge made notes and flipped through the evidence. Eventually, he looked up and announced his ruling. That afternoon was a victory, but not just for the client or the student-attorney. It was a victory for the immigration system. It was evidence that the system works. In considering what it is that we want to fix, we should remember what our immigration laws were written to accomplish. Lost in the talk of immigration reform is the fact that the current U.S. system is the world’s best at reuniting separated families, allowing foreigners to invest in the economy, and bringing talented students from around the world to our universities. The system is good at providing persecuted refugees with a chance to resettle in the U.S. and establish a better future. Many countries have smaller populations, smaller borders, and less demand for visas; yet, they have settled on having immigration systems that are hopelessly complicated and inefficient. It is my desire that any upcoming reform focus primarily on the day-to-day activities that an immigration system must necessarily accomplish. If the overwhelming focus is on having a system that effectively keeps people out, we might end up with a system that does not do much of anything at all. To me, that sounds broken. I profoundly disagree with the premise of this article. Our immigration system is broken and needs serious reform. During the past four years roughly 2 million people have been deported. This is not a system that works. My own experience has been that the system promises a lot but delivers very little. My wife’s son received approval for a I-130 petition in April 2010 at the age of 20. However he “aged out” and now faces at least another five years’ wait to emigrate from El Salvador. Meanwhile, he could be here in the US studying, but instead, he will earn a University degree in El Salvador that will probably be useless here. He cannot marry in the meantime and should the wind blow the wrong way, the whole deal could be off. The problems with the system are many: that the system promises entry for millions of people who are then approved but then have to wait years for visas. That people who could easily find work here have to come here illegally because there is no system for them to come in legally. That people who are here working peacefully are deported and families are separated every day. Meanwhile Congress talks about how we need more high-tech workers from India (read “H1B indentured servants”) so Microsoft can somehow get someone to move to overpriced Seattle to work for peanuts. An finally, the idea that Congress could grant work and residency status to people who came here without documents is infuriating if you have a relative waiting years for a visa. Thank you for highlighting why so many of us get into immigration law in the first place. Immigrants are often so confused by the process and we are able to guide them in the right direction.